Most people can use a bit of good fashion advice. Joel Weingarten realized that by combining a fashion recommendation from a trusted friend or family member with the power of social media, he could empower people to become entrepreneurs. Weingarten traces the roots of StyleOwner back to his high school days, when he and a friend sold flowers off a truck to friends, family and neighbors. "I understood the power of direct marketing from a young age, and I saw StyleOwner as an opportunity to pursue a personal dream to start a business," he says. "As for my fashion savvy, I have an amazing team and leave most of the fashion advice up to them." The New York-based startup, launched in October 2011, lets users create an online boutique and personalize it for their social network by curating from a catalog of more than 2,000 brands, including some from big-name retail partners like Saks Fifth Avenue and Nordstrom (think Pinterest meets online department store). 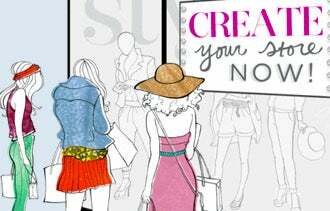 Boutique owners--or "stylepreneurs," as they're called on the site--provide friends with customized recommendations and make a 10 percent commission on each sale. "We're allowing people to monetize their online sphere of influence by coming to our site and, at no cost, building out a store that matches their personal sense of style and aesthetic," Weingarten says. The former robotics educator explains how he's changing the face of online shopping. What innovations have you brought to e-commerce? We feel like we're the first true social selling platform. Sure, social shopping is everywhere, but there's nothing that's actually allowing people to become entrepreneurs and sell to their social network. When you do true social selling, you get a really important byproduct: the personalization of the e-commerce experience. When you think about it, fashion, beauty and accessories shopping with your friends in the real world is very social. That experience online is individual and impersonal. That's what leads to the majority of online shopping carts being abandoned, and only one in 30 people who go to a dot-com site actually buying something. If you go shopping with your best friend in a retail store and get to the dressing room, there's an 85 percent chance you'll make a purchase. How did you raise nearly $2 million in funding? It was really important for me to find investors who would be partners and help me understand the connection between the fashion and tech worlds. First we did a $188,000 raise from six people, some in the fashion industry. With that we built a prototype. We then leveraged the prototype to secure the $2 million raise. When a customer places an order, it gets sent to our branding retail partners, and they ship the product directly to the customer. Then our branding retail partners pay us a commission and we share it. We give 10 percent [of the purchase price] back to the store owner. So we make money off of every transaction. Why would someone want to buy from an individual rather than a retailer? For one, our prices are exactly the same as the brand or retailer that the product comes from. But on top of that, we feel our value proposition to the customer is twofold: One, you get a personalized, curated experience; two, you're supporting the store of someone you trust. Shopping on StyleOwner is like having a personal shopper. People with personal shoppers spend five times as much money, on average. Our store owners can create collections for specific friends and chat with their customers in real time and tell them, "Hey, you're going to look great in that pair of jeans; they're perfect for the event you have next weekend." How does StyleOwner ensure the product goes out as promised? We're very transparent about where the product is coming from. We partner with amazing brands that have great customer service and return policies. When you buy something on StyleOwner, it says, for example, "This item is being shipped by Saks, here's the return policy, and here's the phone number for customer service." If at any point there's a problem with the service a customer is receiving from our brand partners, they can call us, and we'll handle it. We've partnered with 10 amazing charities so far, like the Make-A-Wish Foundation and Women In Need. We feel that StyleOwner is a fantastic fundraising platform. With one click, store owners can choose to donate a portion (or all) of their proceeds to one of our philanthropic partners. If you're going to build a community, it's important to give back to that community.